You may recognize John Ryan as leader of the Moving Mosaic Samba Band. The band plays traditional Brazilian rhythms at festivals around the West Kootenay, connecting with community its mission. Just a few years ago, Ryan took this mission to heart as he sought out a new path, an injury ending his career as an electrician close to achieving his Red Seal. Selkirk College’s Education Assistant & Community Support Worker (EACSW) Program helped the Nelson man learn more about himself and how he could be of service in his community. He graduated from the program in 2015 with a deeper understanding of how to connect with people. John Ryan has found a new fulfilling career supporting people with disabilities after taking the Education Assistant & Community Support Worker Program at Selkirk College. In both the school setting and community, Ryan considers it a privilege to help shape people’s lives. Ryan didn’t come to his new career with fervor. 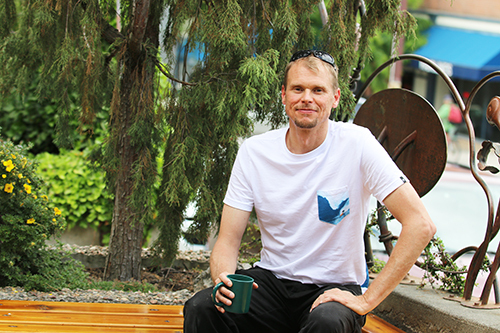 His previous job as an electrician (Ryan also studied for this career at Selkirk College’s Silver King Campus) and work as a tree planter had him in solitude – for the most part – and he had never worked with people with disabilities before. The support worker profession was suggested to him in casual conversation one day and Ryan reached out to EACSW Instructor Jane Green to learn more. Students in the nine-month EACSW certificate program learn skills to help them work with people of differing ability in both classroom and community contexts. Green says graduates find exciting and essential work as Education Assistants, Job Coaches and Community Support Workers across the lifespan. Ryan currently works for at Salmo Secondary as an Education Assistant. He also provides home support through Community Connections for two people with disabilities who are living independently in Nelson. Part of the EACSW program includes examining the history of how people with disabilities have been treated in society. The evolution of care has gone from “doing to” to “doing for” to “doing with.” Ryan learned how to overcome his own awkwardness to be assured in his abilities as he becomes an advocate for people he works with. An important part of the EACSW Program is its practicum component. Students do one week of field experience early on in their training and then a five-week practice at the end of their schooling. While demonstrating their abilities, they self-evaluate and receive feedback. “This was extremely valuable to help make connections to employers while we got into the real hands-on work of it,” says Ryan. By mid-July after graduating from the program, Ryan had three jobs in his new field. Green says this is the case for many alumni. “It’s a really good time to get into this field. School districts in our region and across the province often have more positions than they can fill and not enough people on their sub lists. With recent legislation changes requiring more classroom support, the need will only increase,” she says. Learn more about the Education Assistant & Community Support Worker Program and follow them on Facebook.